This attractive tall clock is among the earliest examples produced in Roxbury by the Willard family of clockmakers. 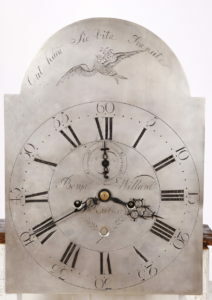 The clock was made by the important clockmaker Benjamin Willard [1743-1803], eldest brother to the renown clockmakers Simon and Aaron Willard. Benjamin was a prolific clockmaker who began his career at his family home in Grafton, Massachusetts, where he also trained his brothers. During his career, he branched-out to several locales, first to Lexington by 1768 and later to Roxbury by late 1771. In mid-1775, as the Revolution began with the Siege of Boston, he would need to move his shop out of Roxbury to Brookline. During these moves he maintained workmen at his original location in Grafton. 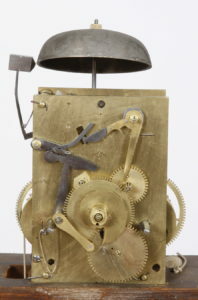 The pendulum that belongs to this movement bears witness to this arrangement, it is signed by a brass works clockmaker, John Morris working in Grafton. It is believed that Benjamin hired him to teach brass clock making skills to him and his younger brothers. 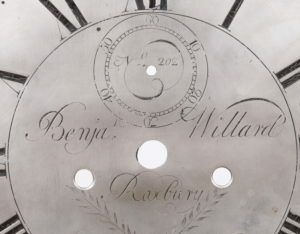 Morris’ name is found cast into the lead backing of some early Willard tall clock pendulum bobs, along with the date 1770 or 1771. [See Paul Foley, Willard’s Patent Timepieces, pg 285] The combination of a dial engraved with the locale of Roxbury and a pendulum produced in Grafton, help to accurately date the clock to some time between 1772-75. The case is primarily constructed of cherry and represents an early example of a “Roxbury” case. The case has a pleasing cherry color and a bright surface. The molded hood is mounted with three fluted chimneys, which frame an distinctive Roxbury type pierced fretwork. The chimneys are mounted with brass ball and spire finials The fretwork and chimneys rest atop a molded arched cornice, all above a glazed tombstone-form dial door. This locking door has a Rococo lock escutcheon. Smooth colonnettes with brass capitals and bases flank the door. The door opens to an engraved sheet brass dial. Each side of the hood has a glazed tombstone shaped window. 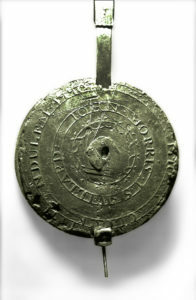 This early dial features an engraving of with a spread wing bird holding a sprig in it beak, perhaps representing the allegorical image of a dove holding an olive branch. Engraved in flowing calligraphy on an arc above is the Latin motto “Ut hora Sic Vita Transite” [As the hour, so passes life]. The clock face has an inner ring of Roman numerals to demark the hour and an outer ring of Arabic numerals to demark the minutes. The dial is fitted with steel pointer form hands and has a seconds bit above the center arbor and a calendar window below. The dial is engraved with a number within the seconds register “No 202” The calendar aperture is decorated with crossed wheat shafts. It is engraved with the maker’s name and locale around the center arbor “Benjamin Willard, Roxbury”. 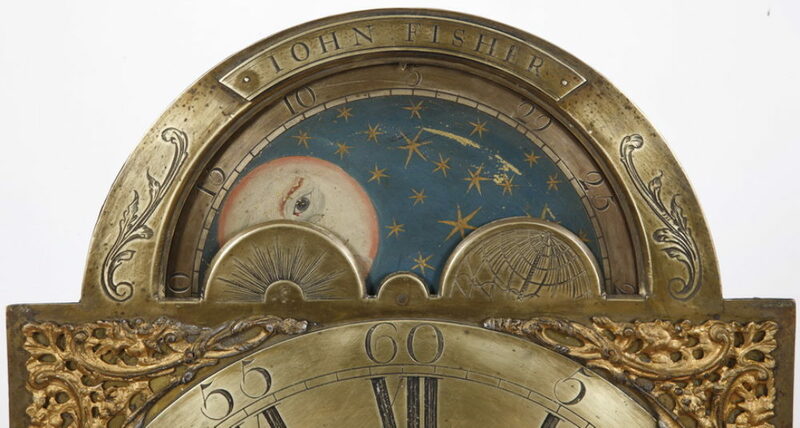 During our extensive conservation program, we have re-silvered the brass dial and returned it to it’s original state. The hood transitions to the waist section with a broad flared molding. The waist has a molded pendulum door with a shaped top. 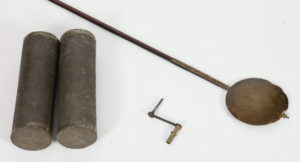 The door, which has a brass keyhole escutcheon, opens to an original wooden shaft pendulum with a brass capped bob and a pair of tin can weights. 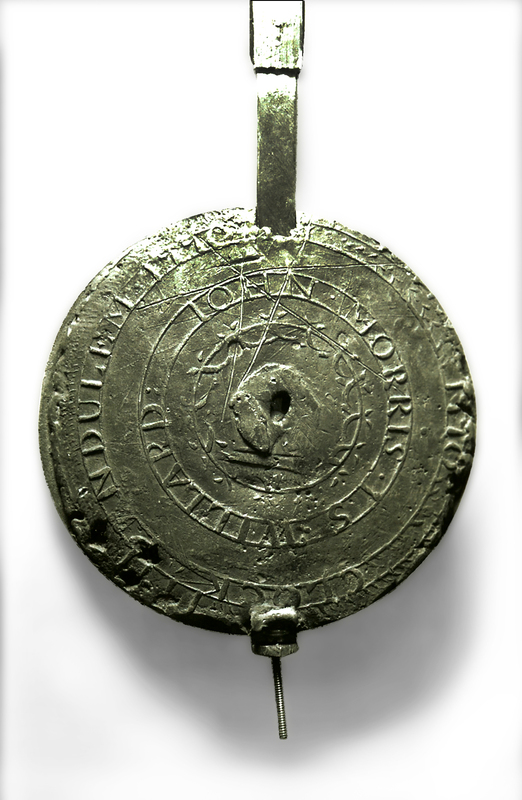 The back of the lead pendulum bob is embossed with the names of John Morris and Simon Willard and is dated 1771. The weight driven, brass eight-day movement has a time and strike train with a cast bell. The movement has recently been serviced and is in fine running condition. The waist transitions to the base section with another broad flared molding. The base has a grained cherry panel above a double stepped molding that joins bracket feet. Dimensions: Height including center finial: 89 ¼”; Width: 20 ½”; Depth: 10 ¼”.